Madagascar has a wealth of biodiversity home to a variety of terrestrial (forests, agricultural spaces, and grasslands), aquatic (wetlands, continental waters), and maritime and coastal ecosystems. Madagascar is one of the richest countries on the planet in terms of biodiversity. In fact, Madagascar has a wealth of biodiversity home to a variety of terrestrial (forests, agricultural spaces, and grasslands), aquatic (wetlands, continental waters), and maritime and coastal ecosystems. This biodiversity is so significant, in terms of the variety of its wildlife and ecosystems, of which 80 percent of animal and plant species are endemic, and exceptional terrestrial and aquatic habitats, that it merits special emphasis. However, this biodiversity is subject to various pressures. The pressures and threats are primarily manmade in origin, driven by the need to satisfy subsistence requirements and improve well-being. Since the Republic of Madagascar joined the GEF, the country has received significant funding from the organization, which has helped mobilize cofinancing to carry out projects in the area of biodiversity. This funding contributed significantly to the establishment and management of terrestrial protected areas such as the various national parks, resulting in such economic benefits as job creation for the surrounding population and the development of ecotourism. The GEF continues to support Madagascar with its commitment to increase the number of marine protected areas in order to [text missing]. Madagascar is also classified as being vulnerable to the effects of climate change. GEF assistance helped reduce the vulnerability of rural communities to climate change in five regions of Madagascar. 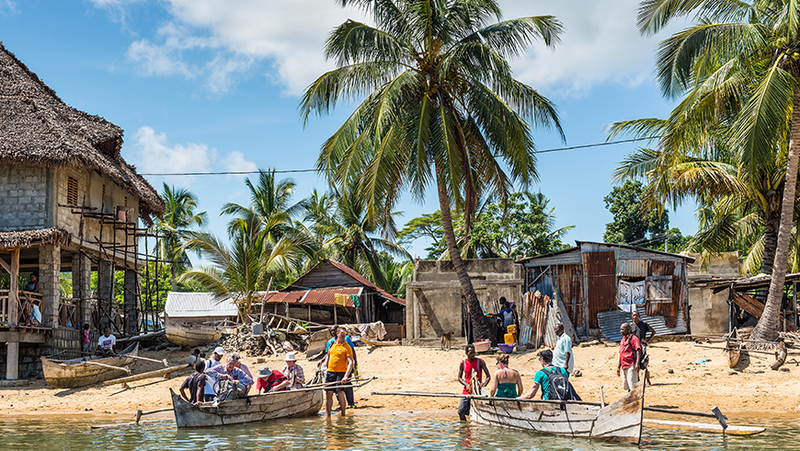 In addition, with LDC funding managed by the GEF, four coastal areas in Madagascar subject to coastal erosion owing to rising sea levels have been [rehabilitated], thus helping enhance the livelihoods of these coastal communities. GEF assistance, with the cofinancing mobilized, also contributed to reducing land degradation and helped Madagascar devise a national action plan to combat land degradation. With respect to combating chemical pollution, Madagascar used GEF funding to develop and update its national action plan to implement the Stockholm Convention. The GEF is also helping Madagascar implement a project to reduce emissions of dioxins, furans, and mercury resulting from the open-air burning of municipal and hospital waste, which is the primary source of dioxins and furans in the country. Moreover, during its fifth operational phase, the GEF Small Grants Programme (GEF SGP) helped carry out activities to support community initiatives relating to environmental protection and improvement of community living conditions. Thus, 104 projects totaling US$2.88 million were financed in Madagascar. GEF support helped strengthen efforts to protect 1,269,000 hectares of natural ecosystems comprising forests (70 percent), lakes and rivers (12 percent), as well as marine and coastal areas (18 percent). The strengthening of governance and community management of natural resources, efforts to combat manmade pressures, the restoration of degraded areas, and outreach to and mobilization of local, regional, and national actors are among the key actions carried out. With respect to sustainable land management, over 677,000 hectares of watersheds (74 percent) and agricultural fields (26 percent) were restored or protected against erosion and other forms of degradation. Efforts to combat erosion were intensified and agricultural techniques that are less detrimental to soil quality were promoted. The community initiatives supported helped avoid 764 metric tons per year of carbon emissions, a contribution to the efforts to combat climate change. In collaboration with other technical and financial partners, micro-hydroelectric plants were constructed to promote clean energy. Furthermore, GEF support assisted with the capacity building of 682 community entities (community-based organizations, community-based federations, community-based unions). Their management and technical capacities were strengthened to enhance their project management and implementation skills and for their self-promotion. In addition, institutional strengthening was carried out to improve recognition of the rights of local communities. These support measures helped local Malagasy communities enhance their participation in national and international forums and events (e.g., COP21, EquatorPrize, World Parks Congress, and ICCA). With respect to beneficiaries, the community projects financed resulted in environmental and socioeconomic benefits for more than 47,000 households. Madagascar also participates in around 20 regional and global projects in the areas of biodiversity, international waters, land degradation, persistent organic pollutants, and climate change. GEF assistance, with the cofinancing mobilized, contributes significantly to sustainable development in Madagascar by supporting sustainable natural resources management and the livelihoods of vulnerable communities and by developing environment-friendly economic activities. Long live the GEF and this unstinting cooperation.